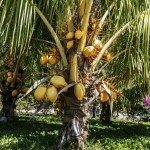 How long will coconut fibre liners last? Planning on planting trailing evergreen heucherellas in a fence mounted trough planter to be a permanent feature and provide screening. Hoping the coconut fibre will last as long as the plants and won't need replacing! Coconut coir liners are considered to be incredibly durable and can be reused for many years if carefully handled. I would hope that you would get at least 3 years out of them with year-round use.